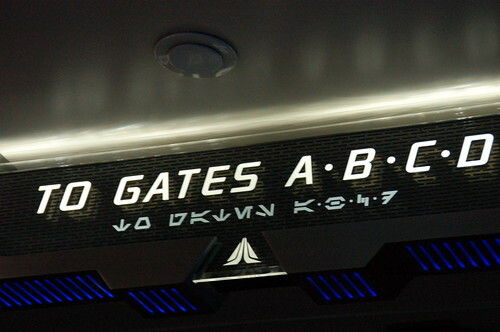 …is where the new Star Tours attraction is located! Well, technically it is in Disneyland (and Disney World) but, well, I was being witty and Star Wars-y so bear with me here. 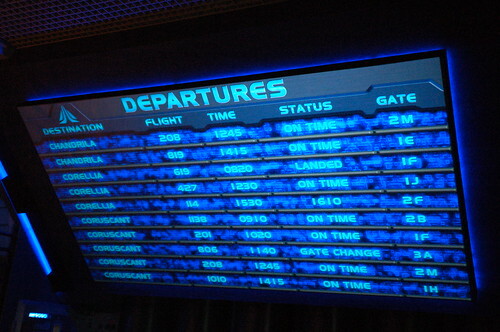 That’s right — for the past couple of weeks the updated and much improved (not that the old one was BAD, since I loved it) Star Tours has been offering flights. 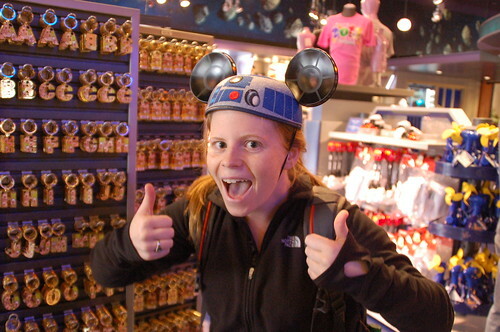 I’m hoping that the lines have subsided some since I went to Disneyland with my friends a few weeks ago. We showed up EXACTLY at park opening (hello 8 AM!) so that we could get a Fastpass — which we were luckily able to get because the wait was already 75 minutes long! 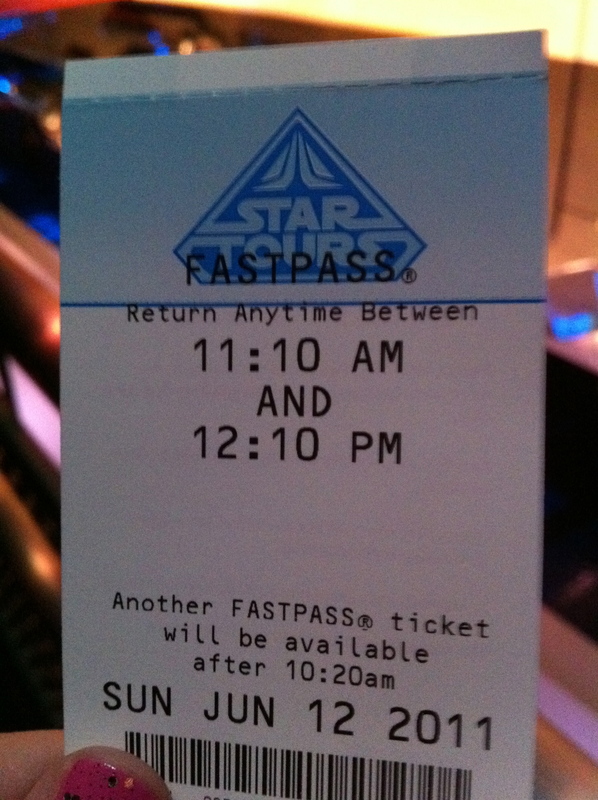 When we came back at our designated time (11:10 AM) Fastpasses were already gone and the wait was roughly two hours. Eek! …and then headed to the boarding gates! 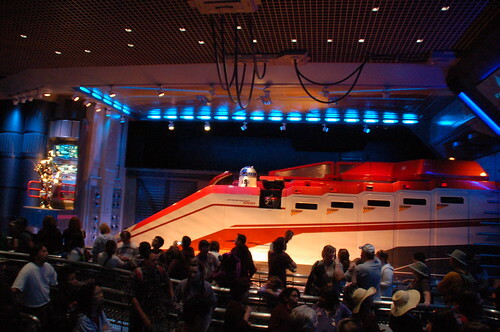 The R2D2 and C3PO scene in the line is pretty similar to the original waiting area. The biggest change is all of the new videos promoting the locations you might visit on your flight — and that’s because you really CAN visit different locations in the updated ride. Each flight makes 3 stops, and there are (I believe) 5 different options at each stop. 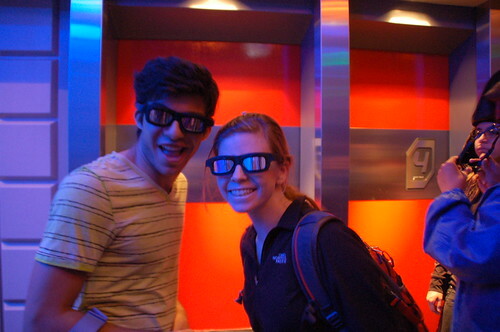 So every time you go on Star Tours you’re in for a different experience. 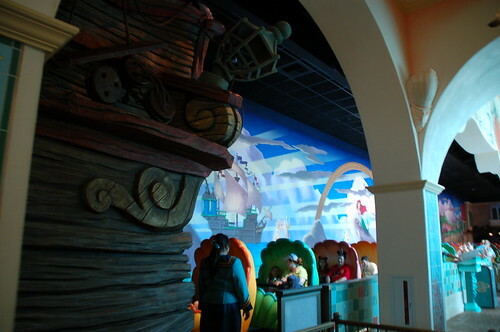 The 3D technology in the new attraction is REALLY cool. It’s so immersive you barely even notice the 3D, if that makes any sense. 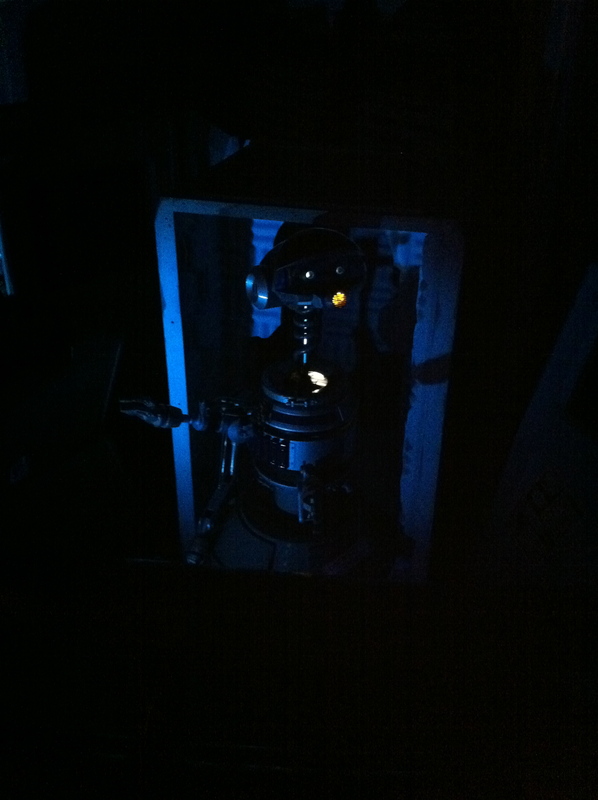 It was really dark, but there's ol' Rex! C3PO makes for a really entertaining pilot! I definitely miss a few of the old parts, like George Lucas appearing on the landing deck (someone let me know if I just didn’t see this??) 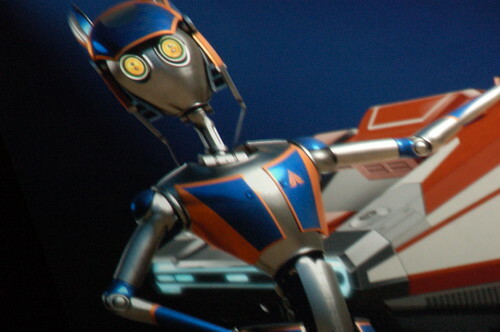 and the crazy lady with the weird side buns in the safety video, but the new Star Tours is a DEFINITE must see. 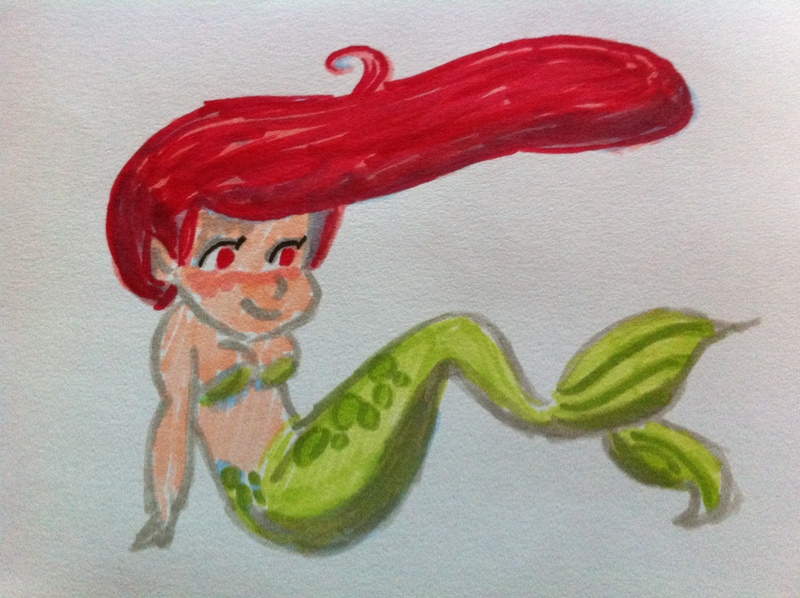 The Little Mermaid was the very first movie that I saw in theaters. My mom said that I spent the entire movie literally sitting on the edge of my seat, not saying a peep, eyes glued to the screen. 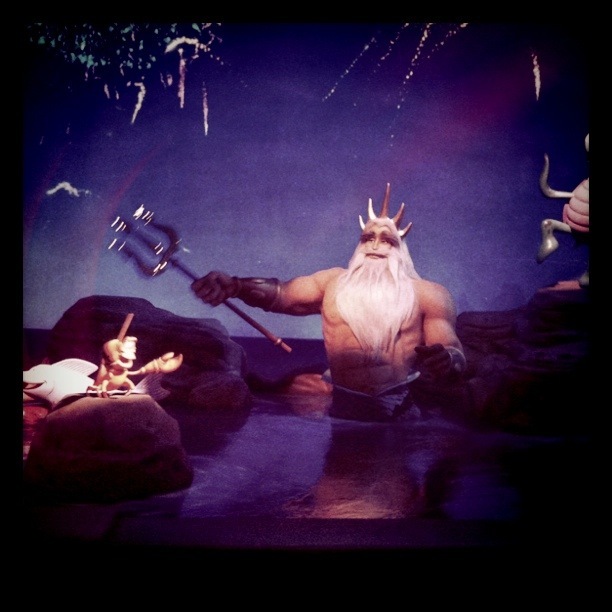 To this day I love that movie – Prince Eric is totally dreamy (for an animated character) and Ursula is one of my favorite baddies of all time. 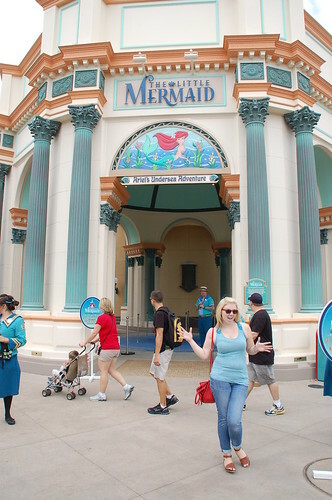 Suffice it to say I’ve been excited about Ariel: The Undersea Adventure at Disney’s California Adventure ever since I heard they were going to start building it…and it’s FINALLY OPEN! 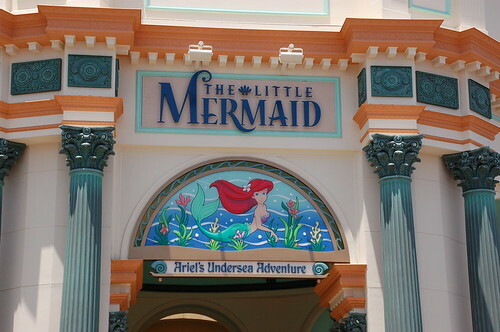 I would describe the attraction as a mix of a Fantasyland dark ride (taking you through a condensed version of the story) and Haunted Mansion (continuously moving Shell vehicles). 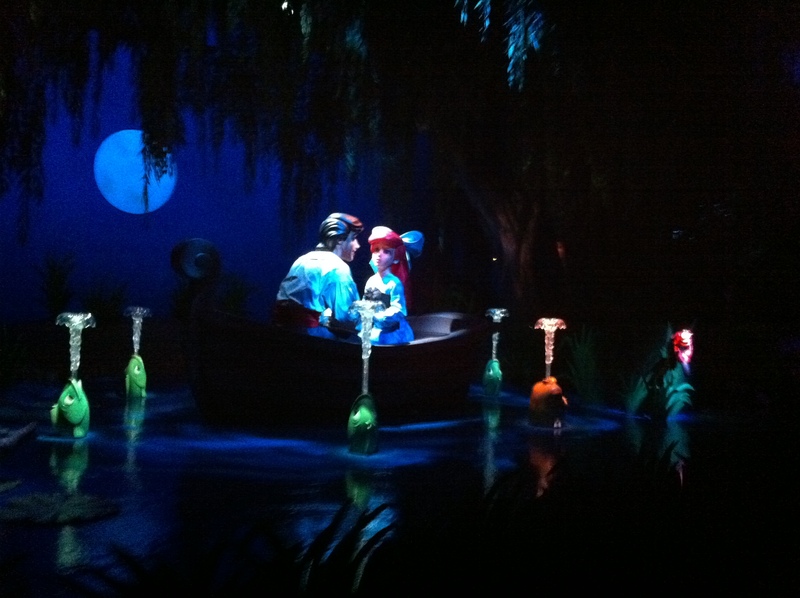 It takes you through all the best songs — including a HUGE Under the Sea area. It really does a great job of immersing you in the scenes. 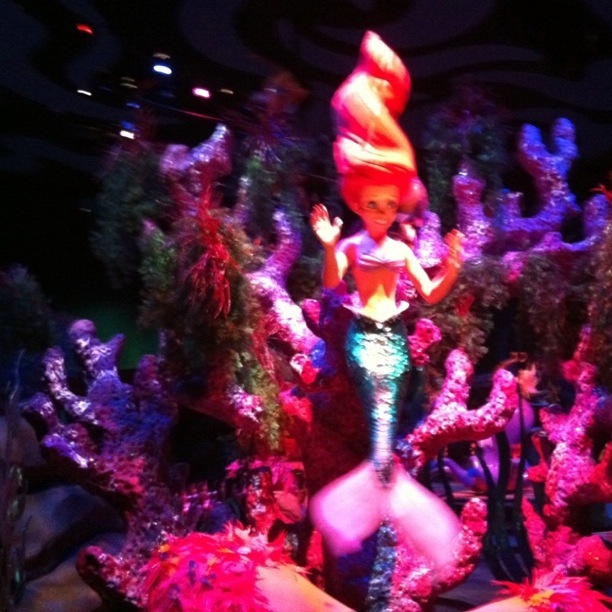 The most amazing part of the attraction is the animatronic characters. I’ve never seen any look so lifelike before! 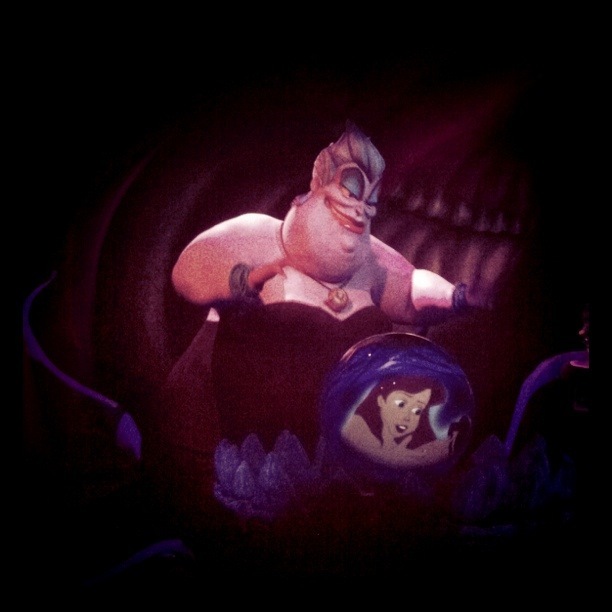 It’s like they’ve literally plunked you into the movie with these characters — Ursula is especially impressive in her movements. 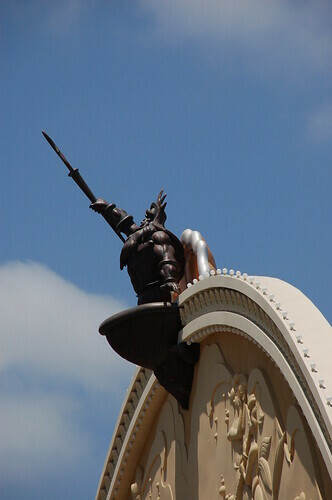 We luckily got the chance to ride it back when they were still doing previews and had no wait, but I’ve ridden it once since then as well now that it’s officially open, and I definitely foresee myself dragging everyone I’m with on it regardless of the ridiculous wait times throughout the summer. Luckily even a long line feels like it’s moving pretty quick with the continuously loading vehicles. I highly recommend it to anyone who’s a fan of the film! It’s the start of summer, and that means time for the Summer Blockbusters to start pouring into theaters. Movies like Super 8, which I just saw last night. A couple of the Arclight theaters out here had Sneak Previews yesterday so Jeremy, Sam & I went to the still-late-but-not-quite-as-bad-as-midnight-showings screening at 11:30 (where we had a MUCH better pick of seats, to boot). I LOVED Super 8. If you’re into classic Spielberg films (think Close Encounters or ET or Jaws) mixed with a slightly more modern blow-it-up style (but not in an offensive detract-from-the-story way) I think you’d really enjoy it too. It focuses really heavily on the group of kids, but they all really held their own, and I was cracking up at how true-to-life their interactions were. I’m sure my written explanation won’t do it justice, but there are some great moments where the kids are all talking at/over each other interspersed with an ever-deafeaning chorus of “SHUTUPSHUTUPSHUTUP”s that had me particularly dying. My parents literally told me that I should go into politics this morning because I got so excited ranting about the movie that I wasn’t taking breaths between sentences and I don’t think they got a word in for a solid 5 minutes. I won’t do that to you poor readers though. Just be sure to stay through the credits if you end up seeing it too — there’s a really good payoff about the film the kids are making in the movie. Have you already seen any of these? Excited about these or other films coming out this summer? Let me know!